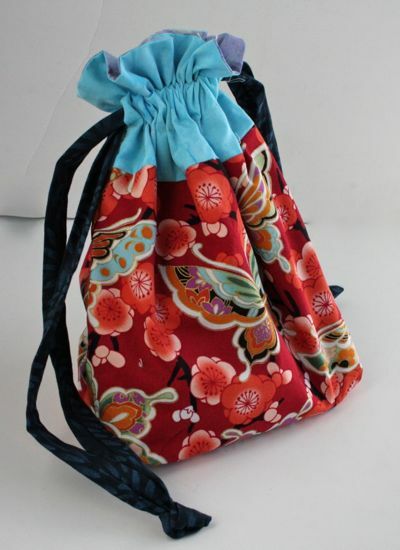 I’ve made a lot of Lined Drawstring Bags of late. 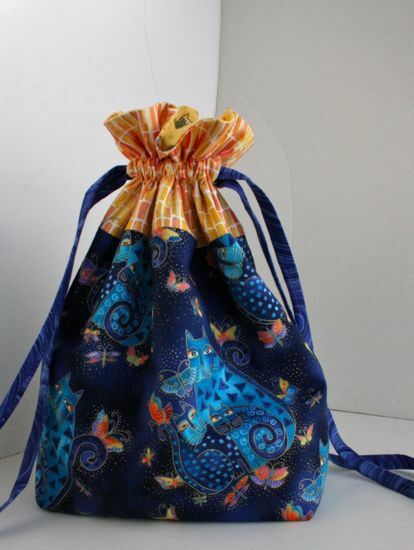 There were all the ones I made for Christmas candy gifting, then two for my Sew Grateful winners back in February. I made this one for Dianne, the woman who has cut my hair for the last eight years, for her retirement. It was a bit fussy to make since I wanted to showcase the Laurel Burch dogs (I only had a few small pieces anyway). 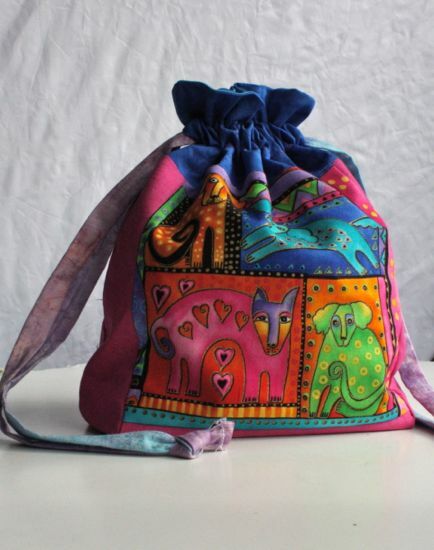 Once I finished the bag, I realized I didn’t like the blue I’d used for the contrast at the top – too light – and the way I’d positioned the dog fabric wasn’t quite right. But I gave all those bags away. 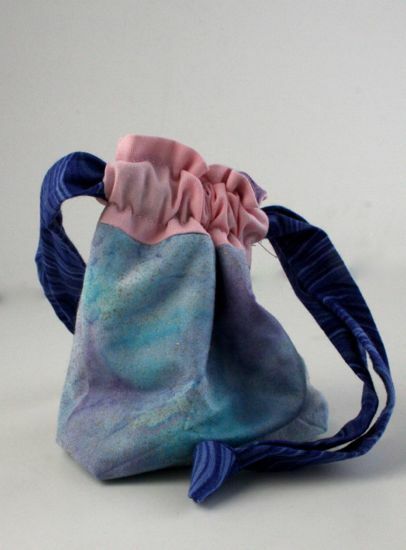 I found I was thinking about which fabrics I’d use to make a bag for myself or which size would be best for carrying just about anything anywhere (lunch, snack, yarn, sewing tools) or just storing something (drawing tools). Clearly the sensible thing would be to translate that “sew for me” energy into wearables, but baggies sew up so much faster! This bag is “everything” sized and transports my sewing tools, things like scissors, pins, seam ripper, seam gauge, fabric markers, etc. I added a series of narrow pockets to the lining to keep things organized. Not sure yet how that will work long term; all the tools in their pockets keep the bag from squishing down small. It’s “project sized” and there’s a crochet project in there. 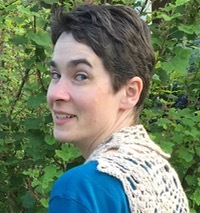 It won’t work if I go crocheting a blanket again, but it’s just right for thing like shawls and scarves. 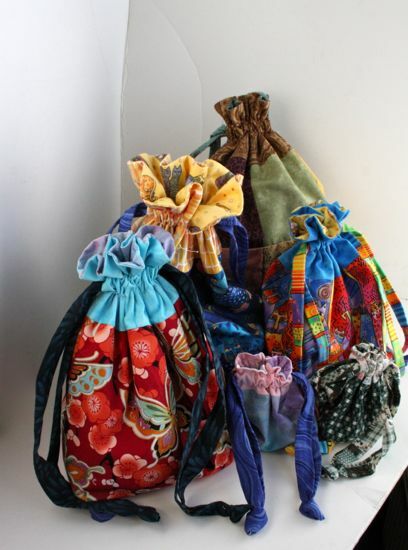 So now I have a whole collection of drawstring bags! I think the only other one of these that’s been posted is my other project bag (in the back, contains a crosstitch project). 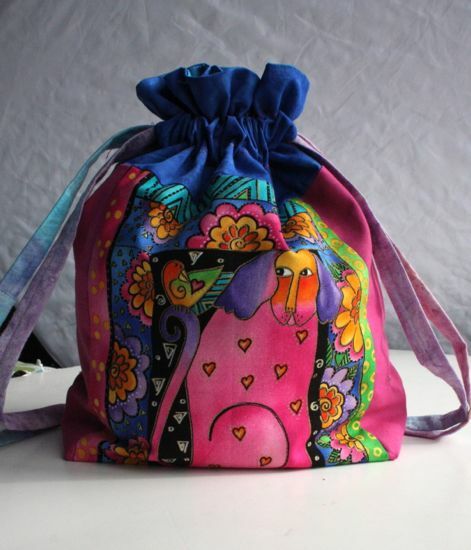 The little green one in the front is a change purse; the other Laurel Burch cat bag was the first one I made. I think I’m set for bags for a while! At least until there’s another gift-giving need, or I can’t put off making one in the “artist” size. First, though: I really should make more progress on the Wardrobe Improvement Project. None of these bags are going to do the trick if I go through the seat of one more pair of jeans.